Table and chairs in balcony. VIP Box seating allows guests to enjoy beer and wine during the show. This Branson show is an award-winning multi-million dollar musical extravaganza with permanent theaters and touring companies around the world! These incredible look and sound a-like artists capture the mannerisms of the stars they portray with amazing accuracy, emotion and attention to detail. You simply won't believe your eyes and ears. 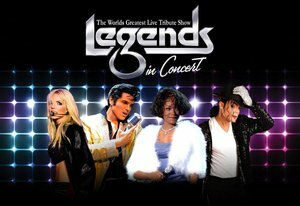 You will be mesmerized by such Legendary Tribute Talents! Acts subject to change without notice.